The first post in this series gave an overview of the advantages of PoE extension technology for long-range Ethernet/IP connectivity—and electrical power delivery—to endpoint devices in industrial applications. Now, in Part II, we will examine a couple of useful applications: an outdoor PoE surveillance camera, and and outdoor PoE horn speaker. Read on. . . Consider Figure 1 below. Typically an Outdoor IP surveillance camera when it is installed normally requires two connections, AC power, plus a high speed network connection for video recording and display. 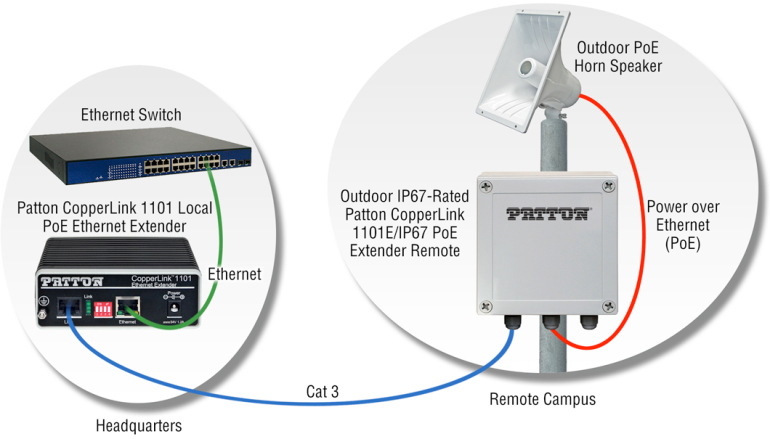 The outdoor industrial PoE Ethernet extender would use just one cable and provide both power and a 100 Mbps Ethernet connection which is fully transparent to the IP video formats/compression schemes. This enables a simple surveillance solution. Look at Figure 2 below. 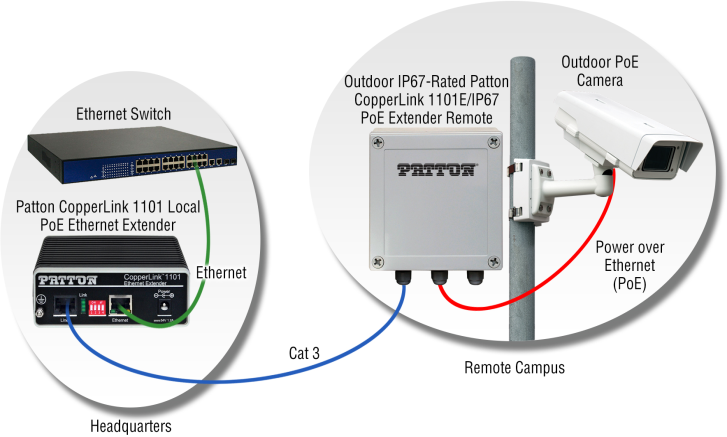 Here, we are able to deliver power PoE (802.3af)-electrical power and Ethernet connectivity to an outdoor Session Initiation Protocol (SIP) based, IP outdoor loud speaker/horn that could be used for voice paging or security/emergency notification and alerting. PoE Ethernet extender allows the Horn speaker to communicate with the SIP IP based centralized Paging system at the factory HQ on the 802.1Q VLAN tagged voice VLAN. Then we will discuss the operational testing we conducted, and wrap up with a conlcusion. >>You can read full online article in the Patton Articles Archive. . .
Did you find the application scenarios interesting?